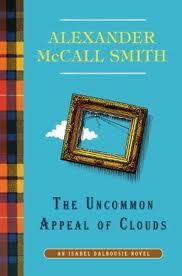 McCall Smith is a large man with rumpled hair, an agreeable voice and a high-pitched laugh. As I had hoped, he is also smart, charming, funny, and engaging. The night I saw him, he spoke beautifully, answered questions graciously (he declined to share his opinion of Scottish independence, adding “if you don’t mind") and wanted to be sure that the audience got to ask as many of them as possible, gently overriding the organizer who wanted to limit the exchange. While waiting in line to have a book signed, the woman in front of me told a story that only increased my respect for the author. Just minutes before the reading she had bumped into McCall Smith outside the restrooms. They chatted briefly and upon learning that the woman’s mother had found his Scotland Street series a great diversion while being treated for lymphoma—she’s now recovered—he suggested that they call her so that he could say hello and wish her well. The phone call was promptly made and received with great pleasure. In the recounting, the story sounds slightly wrong—as if the gesture was that of a celebrity to one of “the little people”, but I don’t think that was the case. I believe McCall Smith is prepared to like most people and is committed to focusing on what is good in the world while seeing the bad with a calm and clear eye. During his talk he spoke for a few minutes about the tendency of modern authors to write about dysfunction, but also noted that he believes there is a place for the other as well, for writing about the ways in which we can be—and are—kind to one another. McCall Smith after signing a book for Ms. Stacked-NYC. McCall Smith currently writes a book a year for each of five different series. I bought this volume, the latest in the Isabel Dalhousie novels. Among the topics addressed are: art theft, “gifted” children, and the importance of trying not to lie—a typical McCall-Smithian mixture of mystery, sociology and philosophy! That phone call is awesome! That is simply amazing. There's nothing in the retelling that makes it sound negative, IMO. McCall Smith currently writes a book a year for each of five different series. Wait. You're telling us he writes five books a year? Five books a year?? Yes, truly amazing! According to the BBC, he also plans to write a libretto for "The Friendship Oratorio"--to be sung at the Glasgow 2014 Commonwealth Games.